Heat oven to 425°F. Spray 18x13-inch rimmed sheet pan with cooking spray. Place 15x12-inch piece of heavy-duty foil on pan; spray with cooking spray. In 4-quart saucepan, melt 3 tablespoons of the butter over medium-high heat. Add sausage, onion and celery; cook 7 to 10 minutes, stirring frequently, until vegetables are softened and sausage is no longer pink. Add 2 tablespoons of the sage, 1/4 teaspoon of the salt and 1/4 teaspoon of the pepper; cook and stir 1 minute. Remove from heat. Add cornbread stuffing crumbs and broth to sausage mixture. Stir to combine. Mound stuffing in centre of foil on sheet pan. In small bowl, mix 2 tablespoons of the butter, remaining 2 tablespoons sage, 1 1/2 teaspoons of the salt and 1/4 teaspoon of the pepper. Rub butter mixture all over turkey breast, and place breast on top of stuffing. 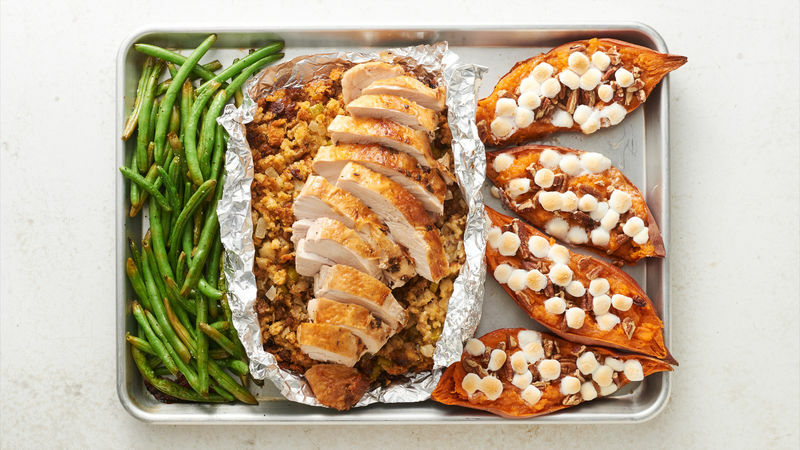 Pull up all four sides of foil around stuffing. Move to one side of pan. Place sweet potatoes on other half of pan. Roast 1 hour to 1 hour 15 minutes or until meat thermometre inserted in thickest part of breast (not touching bone) reads at least 165°F, and sweet potatoes are tender when pierced in centre with fork. Remove from oven; transfer turkey breast (leaving stuffing on pan) and sweet potatoes to cutting board. Let turkey stand 15 minutes before carving. Meanwhile, in medium bowl, mix green beans, olive oil, 1/4 teaspoon of the salt and remaining 1/4 teaspoon pepper. Toss to coat. Arrange green beans on other side of sheet pan, opposite stuffing. Bake about 15 minutes or until stuffing is golden brown on top. In small bowl, mix remaining 3 tablespoons butter, the brown sugar and remaining 1/4 teaspoon salt. Cut sweet potatoes in half, and divide butter mixture between sweet potato halves. Gently mash butter into sweet potatoes with fork. Sprinkle each half with a tablespoon of pecans. Top with marshmallows. Remove stuffing from pan, and cover with foil to keep warm. Place sweet potatoes on pan with partially cooked green beans. Bake 4 to 5 minutes or until tops of marshmallows are golden brown. Carve turkey and serve with stuffing, green beans and sweet potatoes. Use the orange-fleshed, red-skinned sweet potatoes for this recipe. Patting the turkey breast with papers towels to make sure it’s dry will help the herbed butter adhere to the skin.